Hosted by your friendly community, The Chilluminati. Join us in winding down the summer with 24 hours of non-stop psychedelic music, including psytrance, dub/psybient, ambient, chillout, techno, progressive, and old school goa. Just got back from Burning Man? Come decompress. Want a one last mind opening experience before the summer ends? We’re here for ya! 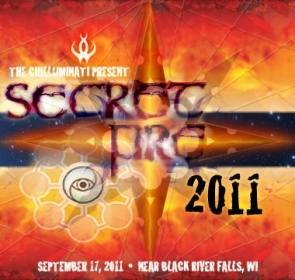 OUR VISION: Secret Fire traditionally has been a more intimate gathering, focusing on the tribal aspects of our diverse community. One stage (outdoors if it’s not too cold or rainy) will carry a non-stop heartbeat of the music that lifts our spirits and binds us together. This event is special, as the stage will be all downtempo and ambient throughout the night, with a special guest to power us into the morning. It is our hope with this event to provide a different kind of nighttime vibe–one that is slow, deep, and ethereal. So bring warm comfy clothes, set up a tent near the stage, relax and do whatever comes naturally, even if it means sleep! COST: Being that it’s the last outdoor event of the summer and the music is only running one night, we are able to offer presales at the low low price of $30. That includes the camping fee for THREE DAYS, music for 24 hours, and most likely hot breakfast on Sunday morning. Additional donations are wholeheartedly welcome. ADDITIONAL INFO: You are welcome to come and set up camp on Friday (some of us will be there!) and stay the entire weekend. The music will only run from Saturday starting around 2pm until Sunday around 2pm. There MIGHT be an option for open decks Friday evening or Saturday morning. We’ll have more info on that later. CHILLUMIWHAT?! : Want to help the community and keep great parties like this happening for years to come? Consider paying more at the gate, volunteer to help us out, tell us your awesome ideas, or simply pick up trash before you leave. The more you give, the more the community thrives! These guys really need no introduction, but we’ll give you one anyway. Primordial Ooze is the unstoppable juggernaut duo of Scott Collins and Igor Vazhenin. Pants dropping basslines, combined with sounds originating from the creation of mankind gives the listener an experience unlike any they’ve had before. Swamp-trance? Psytrance? Goa? What the hell will they play? Come find out! Regardless, you’ll be blown away. We always are. Payer Grove AKA “A Living Earth” was born in raised in Berkely California. His interest in psytrance began in Late 2004. The original inspiration that made him start DJing was attending a Goa Gil Gathering in May of 05. Payer’s presence has been made locally in the Bay Area for the past couple of years, appearing regularly at the famed weekly “Synchronize,” as well as many other major gatherings in California. A truly versatile DJ, he has an ear for the melodic, but is far from afraid to twist you into a dark psychedelic knot. Indeed, his style needs no description, other than whatever comes out of those speakers is sure to fulfill your deepest needs for a cutting edge, transcendental experience.